At first glance, a stair-stepping machine and an elliptical trainer appear to be very similar. The foot platforms on these machines are used in very different ways and provide you with different types of workouts. Identify what your current fitness goals are to effectively choose which machine will present the better cardiovascular workout for you. If your main fitness goal is to burn calories and lose weight, an elliptical machine is a better choice than a stepper. Data published by the Harvard Medical School in 2004 states that 30 minutes of average-paced exercise on an elliptical machine will burn around 335 calories in a 155-lb. person. The same person using a stair-stepper at an average pace for 30 minutes would be expected to burn around 223 calories, meaning that the elliptical trainer helps you burn roughly 50 percent more calories. The stair-stepper machines are effective exercise to "tone thigh and gluteal muscles," notes the American College of Sports Medicine. 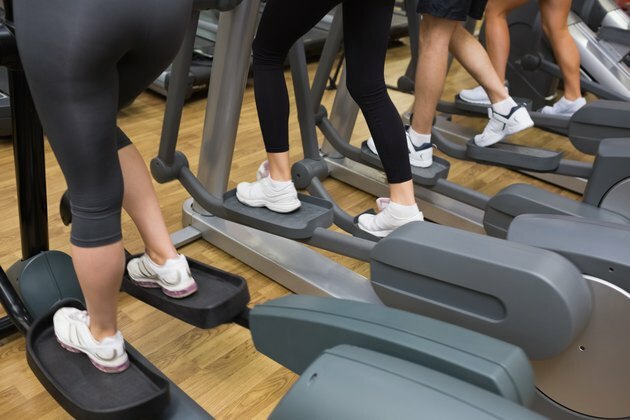 The motion of a stepper machine is focused almost entirely on your lower body and when the resistance of the machine is turned up, a great deal of force from your leg muscles is required to operate the pedals. While elliptical machines help you build leg muscle, the inertia of the pedal stroke reduces some of the work your body has to do. A 1996 study carried out at the Sports Performance and Technology Laboratory and published in the Journal of the American Medical Association found that running on a treadmill is better for "enhancing energy expenditure" than a stair-stepper when perceived exertion is the limiting factor for workout intensity. You'll equally tire on both machines, but you will be working harder on the treadmill. Elliptical machines offer the same style of workout as a treadmill with less impact on your joints. Elliptical machines provide a full body workout, while stair-steppers focus more on your lower body. Some models of steppers, called climbers, employ handlebars that move up and down to engage your upper body as well. Most stepper machines have a stable handrail that you rest your arms on while working out. One drawback of elliptical machines is that the machine may be awkward to use if the stride length is too short for your legs and is not adjustable. Adjustable stride length is a feature that is generally only available in more expensive models. As of November 2010, you can find a club-quality stepper machine for around $1,500. The most expensive models cost between $5,000 and $6,000. Elliptical machines fall into a similar cost range. Both styles of machines have low-quality models that cost a couple hundred dollars or less. Certified personal trainer Brett Spottke suggests avoiding these as a fitness investment.